Never before have these three existed side by side in my house, though I’ve tried them all at one time or another. I favour NZ Marmite, but the factory in Christchurch was closed in November 2011 as a result of damage done by the earthquake in February that year, and when stocks ran out, I had to make do with Vegemite. Recently, the factory started production again, but supplies have not yet reached our supermarket shelves in Australia. A kind friend from Hawke’s Bay on NZ’s North Island took pity on me and sent me two jars of Marmite. 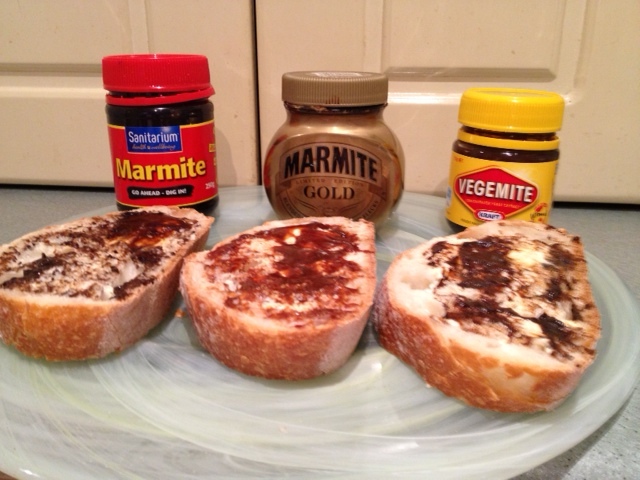 Another friend, from Sydney, decided I hadn’t really lived until I’d tasted again the superiority of British Marmite, and he sent me a special jar of limited-edition UK Marmite Gold, “blended with gold coloured flakes”. Thanks, dear friends—you know who you are. People are deeply divided over these three. In my early adult life, I ate Vegemite until the mid-1990s, when a NZ friend also living in Australia told me she much preferred Marmite. I hadn’t eaten it since I was a child, but when I did, I never again bought Vegemite unless stuck. These three spreads baffle and disgust the uninitiated, especially Americans. If you’ve never tasted any of them, they’re almost impossible to explain to you. They are savoury, and there’s a meaty taste, which might account for the myth I heard as a child that Marmite was made from meat by-products (as opposed to Vegemite, which was supposedly made from vegetable by-products). In reality, all three are made from yeast extract with various flavourings added. The myth must persist, because Sanitarium still feels the need to write “100% vegetarian” on the NZ Marmite label. So this Saturday morning, I decided to do a taste test. I bought a freshly baked loaf of pane di casa and cut three thick slices, spreading each with a little olive oil spread before adding—sparingly as is best—a layer of Marmite, Marmite Gold or Vegemite accordingly. Consistency: sticky and gooey, but not runny. Taste: Balance of salty and sweet. Best way to eat: on toast or plain bread with butter or margarine, accompanied by a cup of tea. Consistency: viscous but runny like golden syrup. Taste: extremely salty – a little goes a long way. Taste: sophisticated, probably more enjoyable for adults than children. Best way to eat: on crackers with gourmet cheese. The nutty, slightly sweet cheeses such as gruyere would work well. Consistency: like margarine; not runny or gooey. Taste: quite salty, and less complex than either of the others; a bit bland after the other two, which is probably why it has been marketed at parents for children (see the Happy Little Vegemites ad here). Best way to eat: in a sandwich with cheese and lettuce, or just solo with margarine. This very Australian-style sandwich was even written into a hit song. Down Under, by Men at Work (“He just smiled and gave me a Vegemite sandwich”). Though I still love my NZ Marmite, the UK Marmite, being quite a different product, could exist with it in the cupboard happily. NZ Marmite is comfort food; UK Marmite is rather a shock to the palate at first, but I could acquire a taste for it as a pre-dinner snack with a glass of wine. Vegemite? Nothing wrong with it, but it’s still my least favourite. Yes, it’s true, and there are several versions of spaghetti with a Marmite or Vegemite sauce. The British chef Nigella Lawson was asked by an Australian interviewer last year if she had a recipe using Vegemite. She said yes, because she had made Marmite pasta, so it could be easily adjusted for Vegemite. 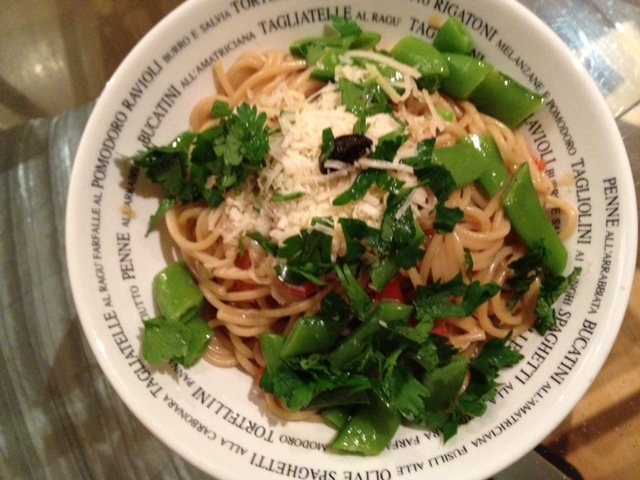 I have made Nigella’s Marmite spaghetti several times and it is truly delicious (my version is pictured above). If you use Vegemite or UK Marmite, add a small amount of sugar, but don’t add sugar if you’re using NZ Marmite. Here’s my effort, adjusted from her recipe. I added sugar-snap peas, parsley and slivers of red capsicum for colour. You can find Nigella’s recipe here. Which has the least calories? This entry was posted in Food & dining and tagged Marmite, Marmite Gold, Marmite pasta recipe, Marmite versus Vegemite, Nigella Lawson, spaghetti, taste test, Vegemite. Bookmark the permalink. Hey Kenny, thanks so much for the reblog. That’s a first for me, too! I used olive oil spread on the bread—just like margarine really, with a slight olive oil taste, which was quite nice with the Marmite and Vegemite. Nigella uses butter in her spaghetti recipe, but I reckon olive oil would be OK in that, too. Apparently in NZ, people eat sandwiches with Marmite and chips (crisps). I vaguely remember girls at school having such sandwiches, though I can’t say I’ve had them myself. We weren’t allowed chips! Yes, Marmite and crisps. And Marmite and cheese, and Marmite and lettuce. It’s been years since I’ve tried any of them – I think I’ve become too Italicised by living in Melbourne so long! Yes, and we often leave things from our childhood behind. Mornings are usually toast or crumpets for me with Marmite on one and tahini on the other. I got sick of the gluggy throat-sticking texture of peanut butter, so started eating tahini. It’s an acquired taste on its own as it has very little salt in it. But now I crave it. An Australian relative who came to stay with us once was aghast when she saw that instead of Vegemite and peanut butter in our cupboard, we had Marmite and tahini! Have since bought a peanut butter that is more natural and I like that better—you can actually taste the peanuts. The colour of the UK Gold Marmite looks like Nutella. I have always been a Vegimite kid. Marmite tastes to strong for me and dare I say it meaty. I totally bought the premise that it had meat by products in it. Yes, me too. The UK Marmite doesn’t normally look like that, it’s just that this was a special one produced for Christmas with flecks of gold through it. Odd, but I like it! I tried Promite during the Marmite shortage. Funny texture, but tasted OK. I’d still put it way behind Vegemite though, not to mention Marmite. I’ve tried some of the other copycat spreads as well, and none of them are any good. Apparently, there’s a German one, and I think Marmite was actually invented by a German in the late 19th century. Beauty is in the eye of the beholder – and it was with great relief that I could leave vegemite on the shelf and return to marmite which has a stronger and more definite taste. I find UK marmite far too runny – just don’t like the texture – too messy, it won’t stay where it’s put and too salty. And talking of meaty smell/flavour – my cat adores the smell of marmite and wants to sidle up to me to smell my breakfast! Yes, I’ve heard that about cats. My cat sniffs and then retreats! Fascinating taste test – great idea. I always swore by Marmite (UK version; the sort on shelves in Australia was too sweet and sticky) but have converted to Vegemite due to cost and ease of shopping. Last time I was back in UK I found Marmite too salty. Interesting the differences in calories/sugar/salt thought – not what I would have expected. Hi Jane, and thanks for your interesting comment. Yes, the calorie count was surprising. You have just triggered a memory. When i worked at Ogilvy & Mather (ad agency) we had an art director who transferred from out office in Australia. He used to eat Vegemite ALL the time. He had cases of the stuff. I have to say, it didn’t just taste bad. It smelled bad. I’m pretty adventurous when it comes to food but I have to admit, I drew the line with this stuff. Hah! I know—seems like, if you haven’t been brought up with Vegemite or Marmite, you find it disgusting. Yes. I think it’s either in your DNA, or you just can’t stand it. Interesting that every culture has delicacies that others recoil from in horror. In Burma, I was served an egg with a tiny bird fetus in it—it would have been rude not to eat it. French snails I cannot bring myself to try, yet I eat shell fish, which is a very similar being, really. I don’t like to eat much red meat, but I love chicken livers. Kangaroo is a lean red meat that, environmentally, we should be eating in Australia. My mum makes a great kangaroo stew…it’s the only kangaroo I will eat (could never eat it as a steak). Yet, I have happily eaten crocodile. A friend cooked “jugged hare” for me once—it was delicious, but the thought of it! I love tiny pieces of Chinese preserved eggs with baked or sticky rice, but I’ve seen others shudder at the sight/smell of preserved egg. It’s true. I love all fish and seafood, including snails and BBQ eel but won’t eat cat fish. I love chicken liver and eat sweetbreads but won’t eat kidneys or tripe or other innards. I love all the ingredients individually that go into it but cannot eat corned beef hash. Love goat cheese but can’t drink goat’s milk. We’re a funny lot, aren’t we? My great-grandma used to make tripe and onions, and I would have to come up with a magnificent excuse as to why I couldn’t possibly eat it. She thought I was strange! I’ve still never tried tripe. People don’t seem to make it any more. There’s a tapas restaurant here and they make it and I’ve seen it occasionally in dim sum restaurants. But it certainly isn’t common. We are a funny lot. There’s plenty of tripe to be had (particularly Asian, but also Italian) – you’re just not looking hard enough! Not a fan myself, though I’ve only tried it once. Not ever looking for tripe! We had plenty of bunny when I was a kid in NZ. I miss it! But it was only ever the young ones, the older specimens being deemed too gnarly to cook (though that probably had a lot to do with the limited cooking techniques utilised). I remember when, in my early days in Melbourne, my dad visited from Dunedin. At Vic Market he was utterly bemused to see that medium and larger rabbits cost MORE than little young ones. And he was FLABBERGASTED beyond speech to see hares on sale. Dad used to shoot rabbits, then we would eat them. A hangover from impoverished student days! Yummo! Watership Downs tastes GOOD! Stop that at once! It’s almost as bad as eating Bambi. I haven’t had marmite in years and I’ve only had the salty one. NZ marmite is in production again however they are having trouble getting it re-stock again in Australia as the supermarkets have not got shelf space for it. Here is hoping loads of people keep bugging the supermarkets to give it a go again. Thanks, Katrina. I wondered if this were the case. I will definitely start bugging them. The cheek of it!